Hello and happy Friday everyone! 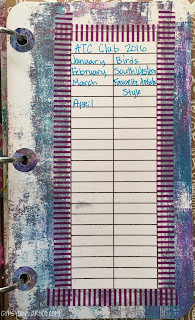 It's time for another weekly share of my Documented Life Project unPlanner pages. The more I delve into this year's DLP, the more I actually like it. I don't usually have a ton of things going on and not a huge amount of "documenting" to do but I like jotting down little things and making small pieces of art to add in - things I can do while sitting on the couch or something. It's also leaving me quite a bit of time for other little projects. 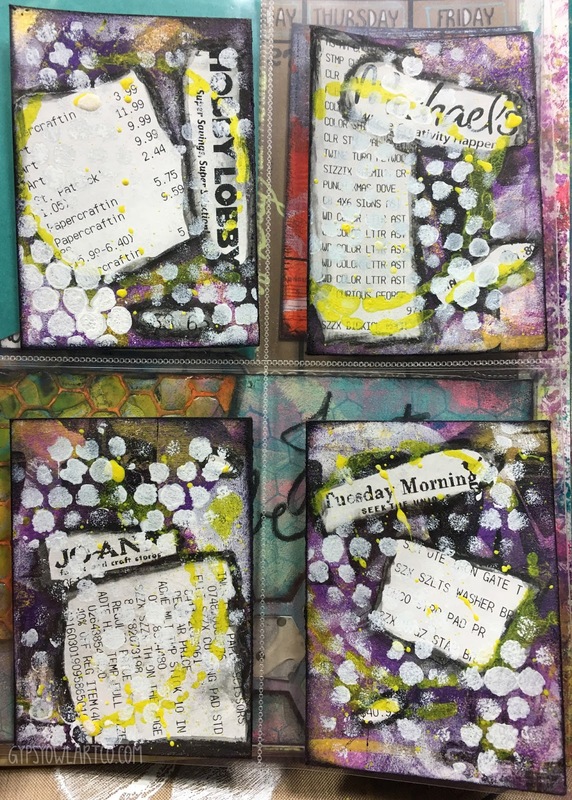 For example, I managed to make two sets of ATCs this week for swaps! 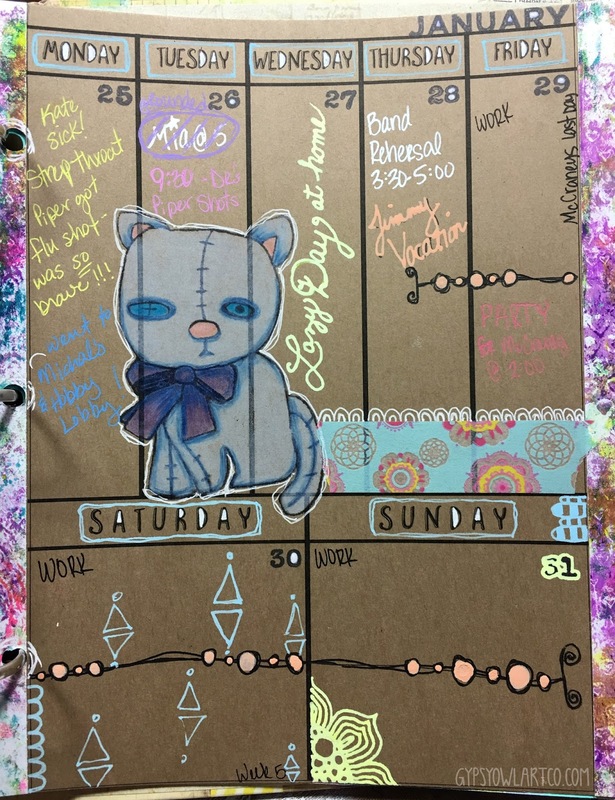 My weekly page so far. Lots of doodles. Not too much in "documentation" other than my youngest (Piper) was super brave for the first time getting a shot! Always a big step for any almost three year old. Cat stamp by Suzi Blu. 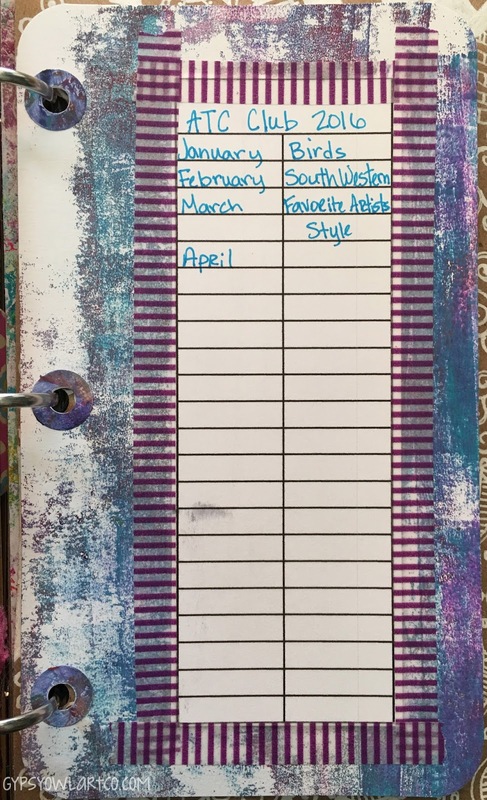 I added in this little gelli printed list so I could keep up with my ATC Club swaps this year. I can move this list from month to month and at the end I'll have a nice list of what I did when. The picture above and to the left are the front and then reverse sides of a piece of kraft cardstock I had cut to originally use for some sort of list. Well, it didn't work out that way! Instead I used it to doodle on! Saturday (January 23rd) was National Handwriting Day so I joined in on Instagram with #handwritingmatters. The sentiment, "I don't believe in practicing safe art!" comes from a video made by Mikey G of Jerry's Artorama on YouTube about getting over the fear of "New Sketchbook Syndrome". It just resonated with me, both about breaking in a new sketchbook and about art in general. 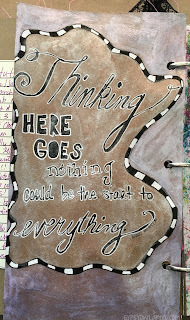 On the back of the card I used a Micron pen to doodle a quote and then used shimmery watercolors (Artist's Loft) in purple and white to add some fun color. 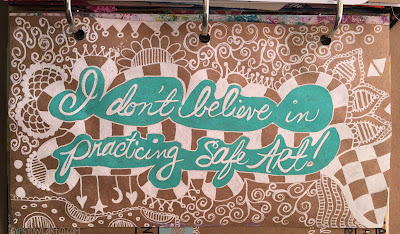 After it was dry I used a Uni-ball Signo to outline my words and fill in the white spaces on the border. If you happened to catch last week's DLP share you might have seen my "I Need This" list on which I recorded some wants. 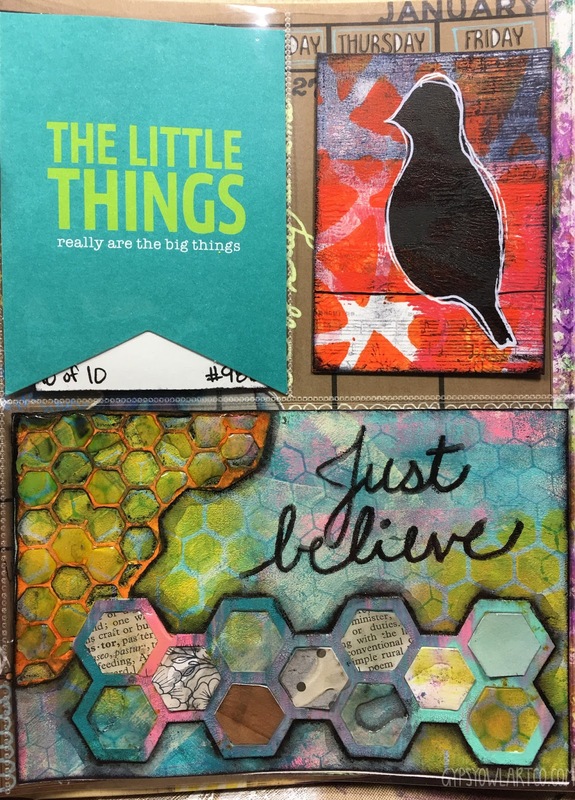 Well, thanks to a wonderful coupon from Michael's I was able to fulfill a few of those wants - a Sizzix BigKick Machine and some Tim Holtz Sizzix dies. This was an opportunity for me to play with my new toys. 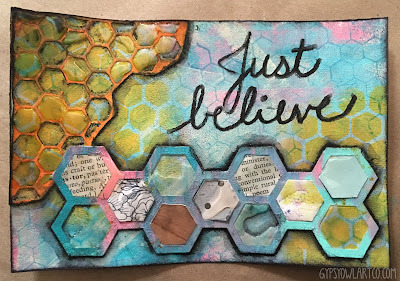 I gelli printed the background, added some stamping and stenciling and then added my honey combs. 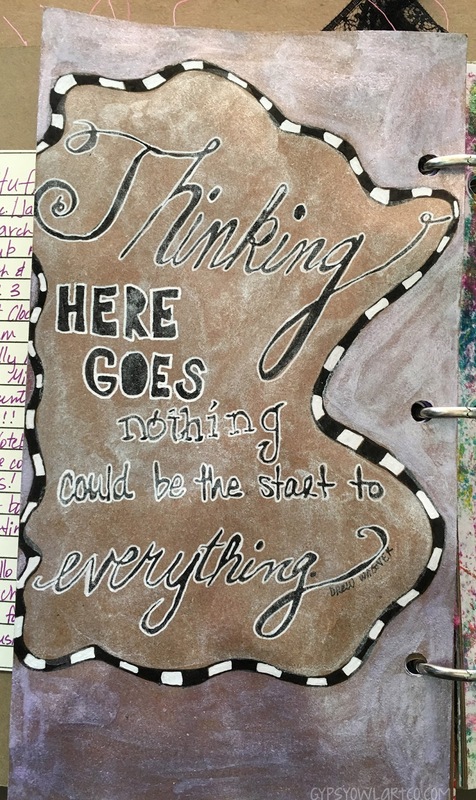 I used Glossy Accents to some of the combs and used a black Stabilo All pencil to add interest and my words. These are my Monthly Pocket Pics - unPlanned favorites. Just a few things I've picked up and created this month that I love and wanted to include. 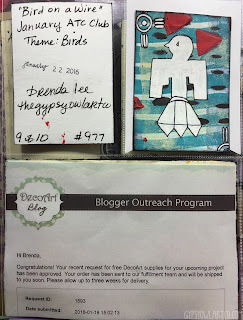 I found the banner in my stash and created both of the ATCs for swaps. 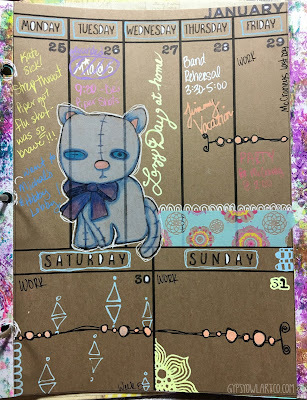 I made too many ATCs so I included these in my unPlanner. 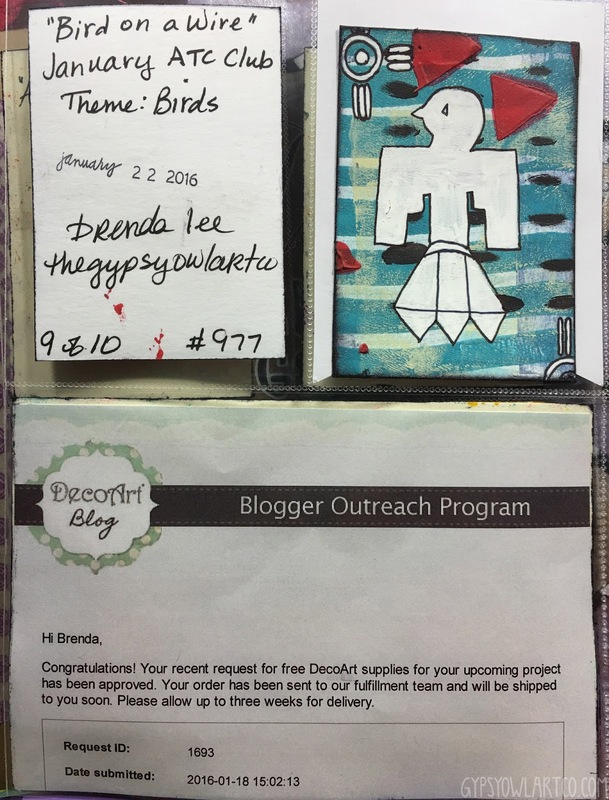 I also had to stash my card in here as well as a print out from DecoArt who approved my request for some awesome goodies! I can't wait for my box to arrive! Our PAC prompt was to include a receipt from our week. Well..... Since I'm still oh-so-excited about my new Sizzix goodies, I decided to make four PACs. One for each of the stores I went to on my shopping spree! 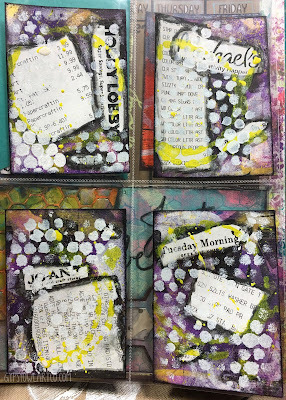 I started with a 3 1/2 by 11" strip of manila cardstock and gelli printed several shades of purple, white, black, and yellow using my 3x5 gelli plate. I am so in love with the "stamping" aspect of gelli printing! 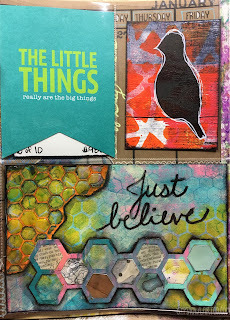 It's so super easy for adding quick color to ATCs, PACs, envelopes, and other random small bits of paper! I then tore my receipts and adhered using a glue stick. I added bright yellow splatters and stenciling, black Stabilo scribbles, and white stenciled dots. Very grungy! Now I will always know when and what and where I got all of these goodies. I slipped them inside a Bo Bunny Misc. Me page protector, stamped the date and wrote the prompt on the back of each card. That's all I've got for this week! It's almost February and I'm looking forward to starting set up this weekend while at work. I'll see y'all back next week for some more fun shares!